Snowfall totals this weekend ranged from a few inches to over half a foot for Long Island! Most of Long Island has been transformed into a winter wonderland after yesterday’s continual snowfall. Nassau County and western Suffolk saw heavier snowfall with totals ranging from a couple of inches to half a foot, while Eastern Suffolk was hit less hard, with totals reaching only a few inches. According to the National Weather Service, our neighbors up north in Westchester got closer to half a foot of snow or more in most areas, and in Manhattan, the official measurement in Central Park was 5 inches of snow, and on the Upper West Side they got a full six inches. Although most of Long Island and the NY Metro area received only six inches or less of snowfall, last night brought heavy rains to some areas, and this morning’s freezing temperatures have created quite the slippery situation – be sure to take care when clearing your driveways, and hitting the road today, as roadways may still be icy, and dangerous. As more towns report in, we’ll be updating our list, so be sure to check back! How much snow has fallen in your neighborhood? Let us know! 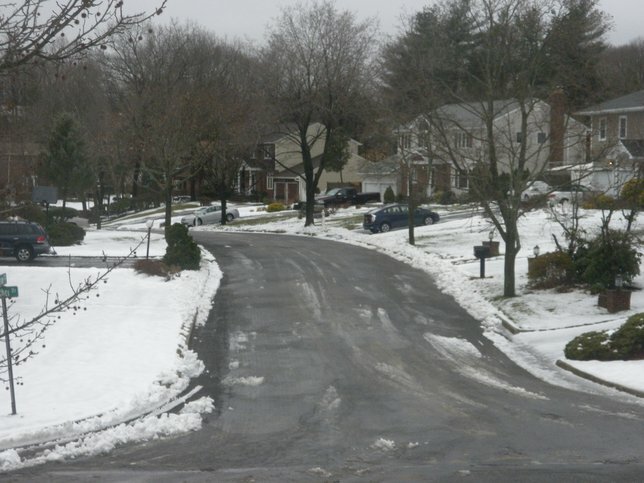 Pictured: A snowy residential road in Suffolk County. Subject: LongIsland.com - Your Name sent you Article details of "Snowfall Totals for Saturday's Storm: 6 More Inches Piled on for Some Parts of LI"